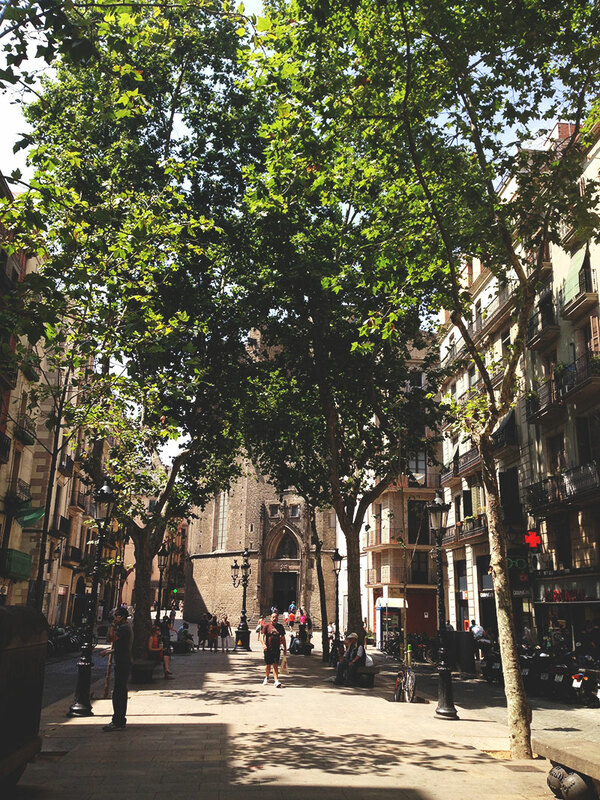 Last summer, after the dengue had faded from my blood, after I had put on a bridesmaid’s dress to watch my best friend marry her life’s love, after I had repacked my backpack and rebooked flights to Bangkok, I spent five days in Barcelona. The idea behind this was that I would already be in Spain for the wedding, and so would travel overland from Marbella to Barcelona to meet my parents and my brother, who I hadn’t seen since the previous September; and Rikki, who would be flying back to Asia with me. Of course I had helpfully contracted dengue fever a month earlier and flown home, making this plan slightly redundant; however we had all decided to do it anyway because, well, Barcelona. It was not my first time in the city, and the warm golden-hour streets and air full of summer holiday smells felt strangely familiar in contrast with the discord of the last month; which had seen me ricocheting from monsoonal island to sterile hospital to damp British summer to Spanish seaside and back again. I arrived first, alone, and wandered the narrow cobbled streets of the El Born district in my backpack, peering up at the rectangle of pristine blue sky visible between the balconies and fluttering washing lines, until I found the apartment number of our Air BnB. After negotiating five floors of narrow, treacherously steep stairs, I was greeted with a kiss on the cheek by my effervescent host and left alone with instructions to enjoy the apartment and to drink the bottle of wine left on the kitchen counter. Not a problem. I unpacked the basic provisions I had bought on the way from the airport and made a sandwich from some iberico ham, cheese and fresh tomatoes, chewing it slowly as I wandered through the small rooms to the balcony. There was a warm breeze up here which shifted the curtains slightly, and a shaft of sunlight that fell across my face. I could see people moving in the apartments opposite and below me, preparing lunch, playing with their children, working at desks placed near open windows. 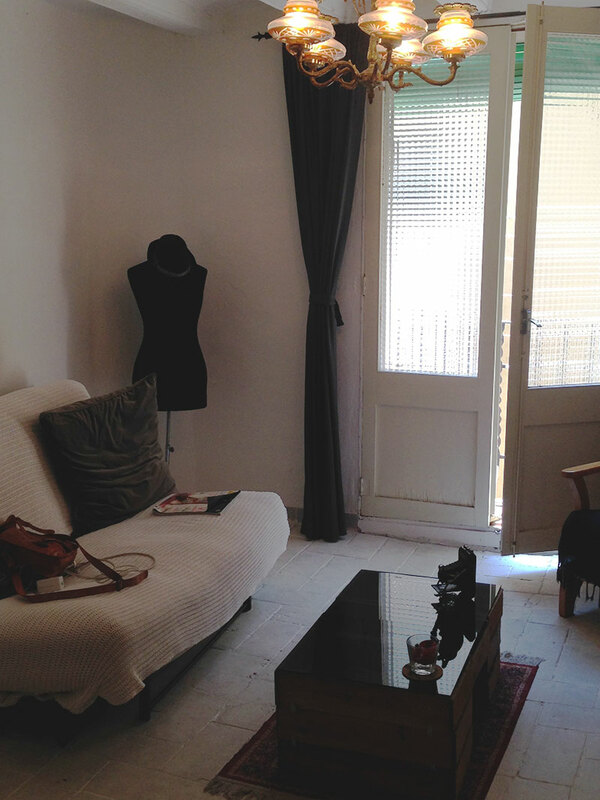 I stood for a moment, entertaining the fleeting fantasy that I was one of them, that I called this beautiful apartment in the heart of Barcelona home; spending weekends at the beach and shopping for cured meats and cheese in the covered markets and speaking with my neighbours in fluent Catalan and Spanish. Then I went inside again to unpack my backpack. Rikki was flying in in the early evening, and I ventured out a couple of hours later to explore the area and meet him at the taxi rank around the corner. The warmth of the day lingered in the stone walls, and tapering candles were being lit on tables outside the restaurants that lined the streets in the soft gathering dusk. I walked slowly, looking at everything, smiling at the groups of people who sat and drank and smoked and laughed beneath trees strung with tiny twinkling lights, enjoying my last hour as a solo traveller for a while. I leaned against the wall, wearing a red sundress and smoking a cigarette in a way that I imagined made me appear very European and chic, and waited for him to appear from one of the many yellow and black taxis that circled the roundabout in a swooping blur of headlights. We walked back to the apartment together to drop his bags, and then went out for big, celebratory cocktails full of rum and ice. The next day was Sunday, so we went to look at a church. It had that smell that churches have, and it was wonderfully gothic and gruesome in the way that only Catholic churches can be, with light dancing across the walls from the hundreds of candles that stood in red glass votives on every surface. Afterwards we went for breakfast and to the Picasso museum, which threw Rikki into paroxysms of confused dismay that someone ‘who can actually paint’ would feel the need to ‘stick people’s mouths on the side of their heads’. To help him recover, we went to eat ham. Lots of ham. That night we went to see the magic fountain, which was up there with the best date nights I’ve had. 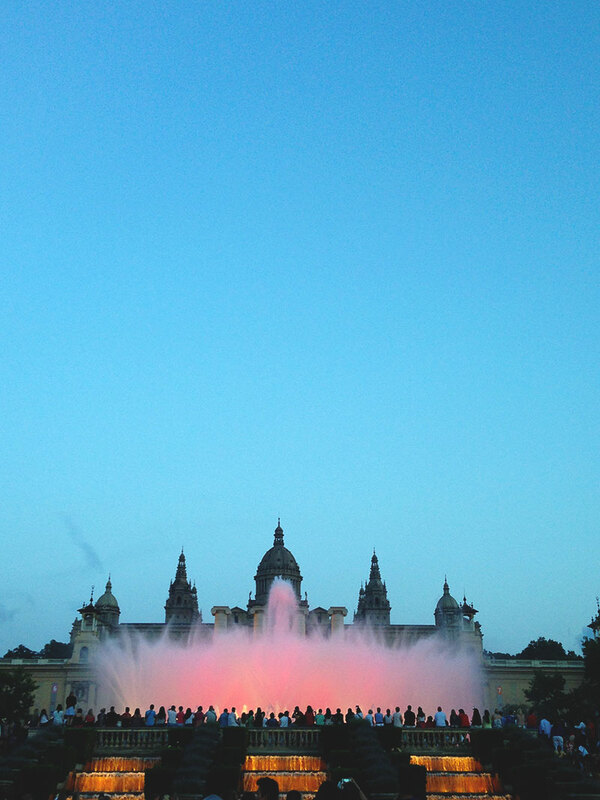 The fountains ‘dance’ in time with the music and light show, shooting plumes of water high into the air at timed intervals, and the whole thing is rousing and fun and really quite beautiful against the backdrop of the Museu Nacional D’Art De Catalunya. I took my shoes off and sat on the very edge of the fountain, watching the water arc above my head and letting the mist settle in my hair. Then we went to find some more ham. 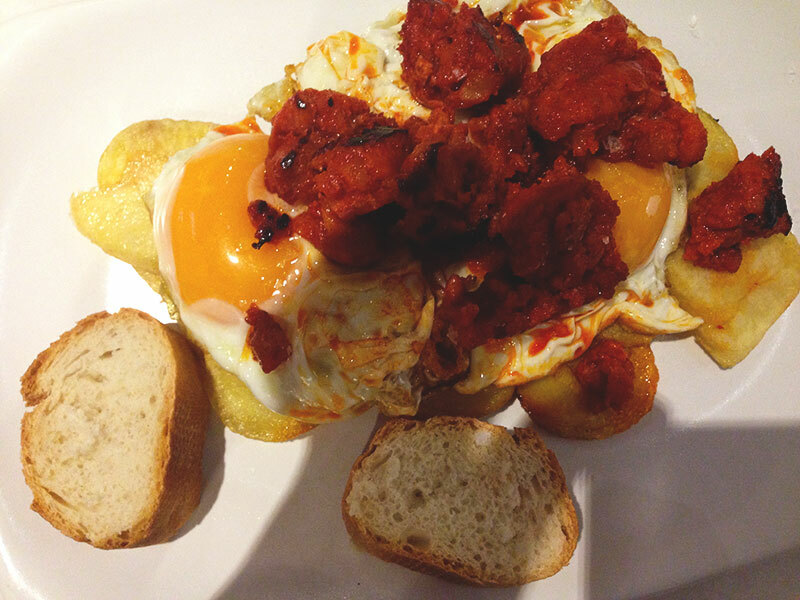 My brother arrived the following day, and we went to meet him on Las Ramblas after a breakfast of eggs and chorizo piled on top of potatoes and bread, leaking sunshine yolk and spicy oil everywhere. My brother is always quite easy to spot in places like Barcelona, even amidst the meandering crowds of Las Ramblas, because he’s 6 feet tall and dresses exclusively in black (he’s a drummer in a rock band). He bounded off the bus towards us, grinning and shrugging off his leather jacket in the hot sun, and we spent the rest of the afternoon drinking beers at a formica topped table in a leafy, sun dappled square in the Gothic Quarter, waiting for my parents to arrive. 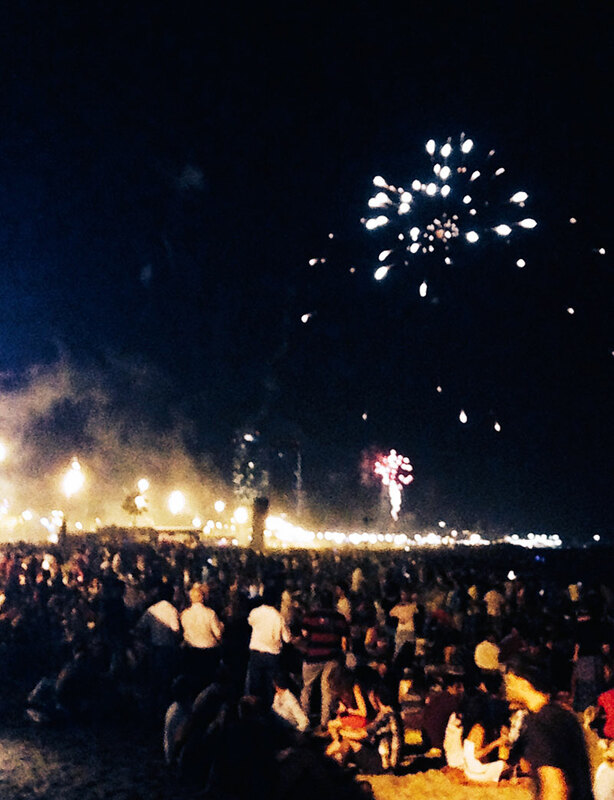 Unbeknownst to me when we booked the trip, that evening was the Feast of Sant Joan, a huge Catalan solstice festival known as Nit del Foc – the night of fire. We headed down to the beach amongst a tidal wave of revellers, and managed to commandeer a table outside one of the chiringuitos that stood on the edge of the sand. The beach stretched to the horizon, and everywhere people sat on picnic blankets with their families, drinking cava and pulling bundles of food wrapped in paper from huge baskets and cool boxes. Music pounded from huge speakers, and as the sky darkened the coastline lit up in a twinkling row of lights. As we approached midnight, the fireworks started, and the sky filled with flashes of sparkling colour and the lingering smell of gunpowder. For the next two days we wandered and ate, stopped for a drink, ate some more, and began the hunt for dinner as the late afternoon shadows lengthened into evening. 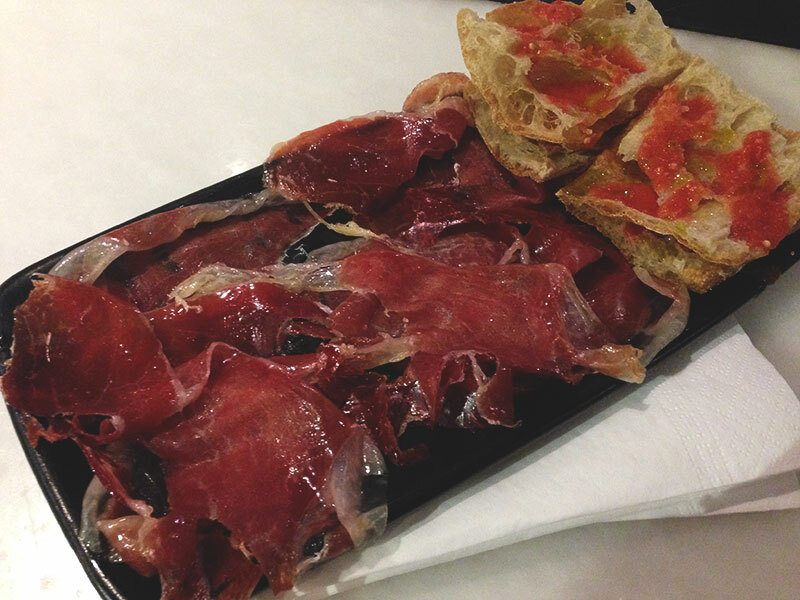 We meandered through La Boqueria, and ambled through the twisting maze of the Gothic Quarter. 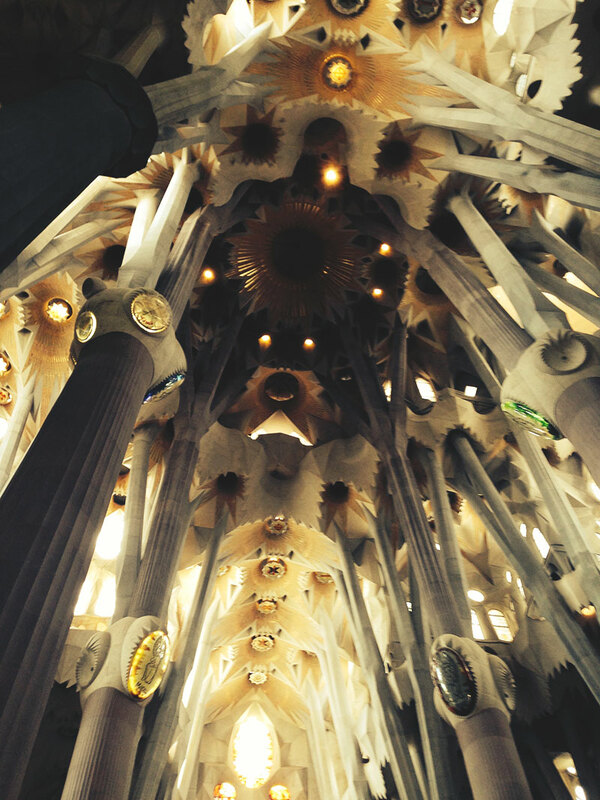 We went to La Sagrada Familia and stood with our heads thrown back in awe at the rainbows of light pouring in beneath the carved canopy of that ceiling. I’ve seen it before, but it was no less heart stopping on the second visit. On the final evening we ate on a picturesque square off Las Ramblas, and then Rikki and I said our goodbyes and got into a taxi to the airport. 36 hours later we were in Bangkok, headed overland to Myanmar. The displacement was once again acute, side swiping us with jet lag; but still, after five cool, sea-blue days in Barcelona the hot darkness of Bangkok felt like a different kind of home.